Date Added: Wednesday 04 January, 2017 by Jay L.
Buy one. Just buy one. It's as simple as that. Having already owned a suit off the overstock store I slowly began wanting a suit custom made to my measurements. As soon as I found out that Magnoli had updated the fabric to be even more screen accurate, I jumped on a new suit. The old fabric was very good. The new fabric is incredible! As always, the construction of the suit is beautiful. I had to take it to be altered slightly as it was a bit too big, but I blame my measurements for that. If you're considering buying this suit, what are you waiting for?!.. Date Added: Monday 07 November, 2016 by Niko V.
Date Added: Friday 21 October, 2016 by Jason P.
Date Added: Thursday 12 May, 2016 by Nathan S.
Date Added: Monday 28 March, 2016 by George M.
Date Added: Saturday 26 March, 2016 by Romil I. This suit is -- to borrow a phrase from Ten's predecessor -- FANTASTIC! I ordered it in the custom cotton in addition to a few yards of the same fabric so I could reuse the trousers as part of an second costume (I'm new to cosplaying so I'm trying to maximize the value for my money), but I have to say I'd probably wear this out in public as an (extra)ordinary suit as well. 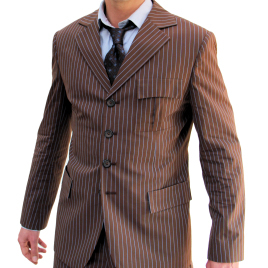 The fabric looks spot-on, the tailoring impeccable, and delivery was so quick you'd think it came by TARDIS Express! Thank you Indy!..